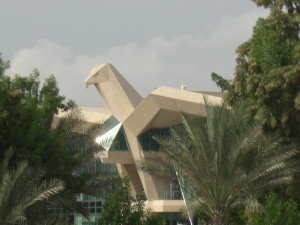 The biggest eagle in the world is watching over the Abu Dhabi Golf Club. After this big bird had fallen in love with golf, the remarkable eagle started to steal the golfer`s balls as often as possible, scooping them up in its huge claws. It became such a frequent theft that the golfers gathered for a general meeting to find a solution against this thief from the sky. One club member knew a magician, whom they asked to stop the eagle´s wrong doing. The magician put a spell on the eagle to be guardian of the club house. Turned into a stone statue and now the biggest eagle on the planet the bird does a much better job of guarding the very special club house. The legend goes that the magic will be dissolved once a golf professional wins the annual European golf tournament five times in a row. Martin Kaymer, the German professional superstar, might be able to free the eagle. With his three wins between 2009 and 2011 he has already done it three times in a row and with this outstanding achievement Martin could quite possibly take the very prestigious trophy home to keep it forever. 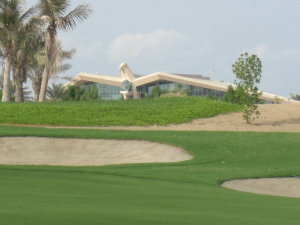 If Martin wins the next two events the eagle from Abu Dhabi Club house will be free in 2013 and the winner will decide the fate of the golf club and the course. 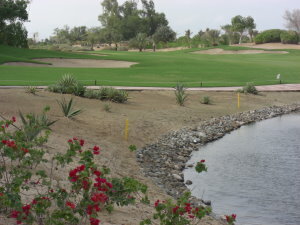 It is a very special golf course planted in the dessert. Green surfaces surrounded by lots of sand but also lots of water. And of course all watched over by that huge eagle. Our charity game was with Gerhard Cammann, a still very young golfer. For him it was a great experience to play on one of the world´s best golf courses. The critical view of the huge bird may have been putting Gerhard off as every now and then he played some unexpected shots. But overall Gerhard enjoyed this special golf day a lot. 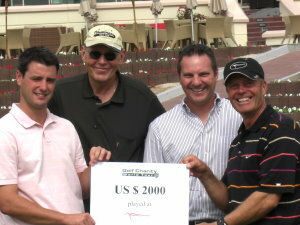 Phil Wane and Scott McCaw, who are part of the Abu Dhabi Golf Club management team, also had a good time and received our charity cheque of US $ 2000. The money will be used to support HIV infected children in Africa.